If you haven’t read the Hunger Games, I won’t tell you to…even if you aren’t a fan, this collection from China Glaze, The Capitol Collection, is one you shouldn’t miss! I’ve already swatched one color from this collection, which, by the way, is my absolute favorite! It’s called Foie Gras. 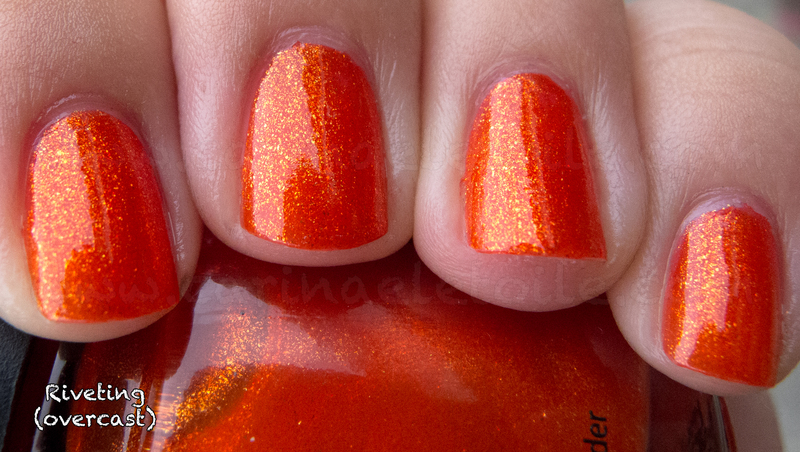 I’ve always been a huge fan of China Glaze…and somehow, they have yet to lose their allure in my eyes. I love this particular jelly for Riveting. FYI – Riveting represents District 3- Technology. I have some really bad issues with jelly polishes in that they are rarely ever opaque enough. 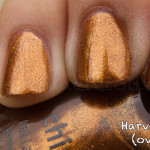 This was opaque in 2 mega lazy, medium coats and is so crazily orange and shimmery, I feel it’s one you shouldn’t miss. Even if you don’t like oranges or feel like you don’t want it, you still should get this color – that’s how much I LOVE THIS! Also, as I was applying this, I kept thinking that this would be one of those killer bangin’ shades for Halloween! It’s got that fall feel to it. It’s actually made me really excited for the end of the year. Haha. Not only was this shade something for me to love, it was also something that made me fall in love with jellies all over again. If jellies could deliver the kind of punch this one does with reasonable opacity in two medium coats, I’m all for them! Plus, this formula dried very quickly and that was another lovely surprise. However, what did surprise me even more was the incredible high gloss this color had. I was surprised given the glass flecks inside the color. Come see what I’m talking about! As always, please click on the thumbnail to bring the picture to its original size. The overcast day does not do this justice!